It’s no secret that rents are going up around the Austin area, with one bedroom apartments often renting for over $1,000 a month. Particularly in the more desirable neighborhoods near Downtown or South Austin. With over 2,056,405 residents, Austin continues to grow as an average of 159 people flock here per day. Austin’s healthy job market, booming economy, and plethora of activities make it the perfect place to settle down – if you can afford it. Planning to live in a neighborhood that is not only desirable but falls within budget can be tricky. Rents can vary widely, depending on where you look, depending on amenities and area of town. 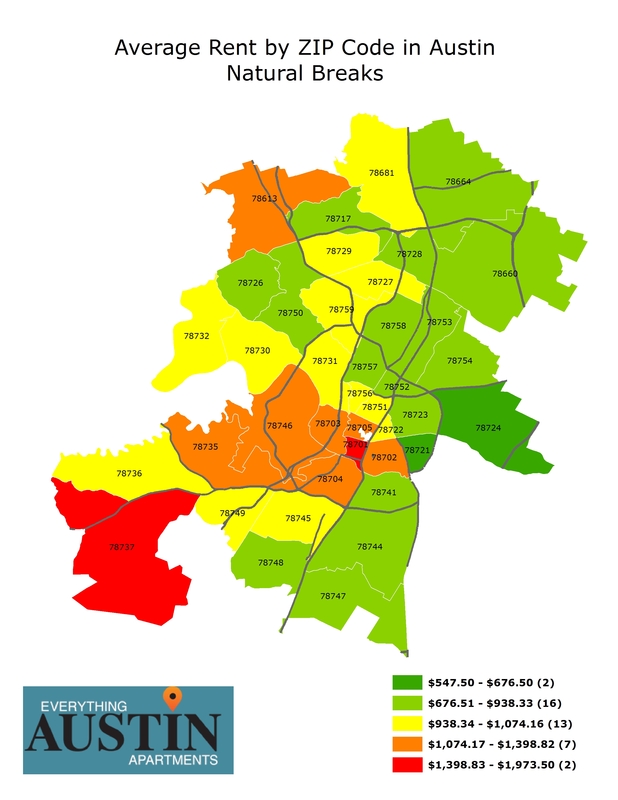 Our friends at EverythingAustinApartments.com accessed rental data that displayed the median rent for a one-bedroom apartment across the Austin metro by zip code. Surprisingly, the most expensive zip code was nowhere near Downtown Austin. Where are the cheapest and most expensive zip codes in the area? Here’s a breakdown. 78737: Coming in at number one is an area just outside of Dripping Springs. While this may be surprising to some, the area along Highway 290 has a few luxury apartments that fetch much higher than average rental rates. These skew the average number pretty significantly, with rental prices for a one bedroom apartment sitting around $2,000 a month. There are still many affordable options in this area, but the costlier ones will come with luxurious amenities and ample room to spread out. People moving to this area can expect gorgeous Hill Country views and enjoy the quaint restaurants and shops available nearby. Those who want a more country vibe while not sacrificing proximity to the city and amenities will love the 78737! 78701: Sitting in the heart of Downtown Austin, the 78701-area code is what most would expect to be the most expensive area of Austin. Many one bedroom residences here are condos, and you won’t find an overwhelming amount of apartments for rent here. The ones that are available will be upwards of $1,650 for an, on average, 550 – 650 sqft apartment. What these rooms lack in space, they make up for in amenities. Most apartments are updated with luxury features like rooftop pools and state of the art lounge areas. Their proximity to the many employers Downtown make residences in the 78701 the perfect place for young professionals who want to be in the mix, close to fine dining, Austin’s fantastic nightlife, and Lady Bird Lake! 78702: This area is growing more popular by the day, and apartments are springing up in droves. Sitting just east of I-35 Downtown and north of Ladybird Lake, the 78702 is what most people would consider the “East Side”. Hugely popular with young professionals and those in the artist community, the East Austin is full of eclectic dining options, art studios, and unique nightlife options. Still extremely close to the high-rises of Downtown and Ladybird Lake’s hiking trail, this is the perfect place to live if you want to explore the hip and unique charm of Austin. The median price for a one bedroom apartment will run you around $1,420 a month, but prices are going up as more luxury accommodations are built. Many new apartments are offering luxury features, hip poolside living, and unique amenities not offered elsewhere in the city. 78703: Right next door to and similar to the 78701 zip code, the 78703 stretches past Mopac into what some would consider Westlake. Many of the properties in this area sit along Lady Bird Lake or Lake Austin, so that adds to the luxury factor for many. Proximity to Downtown, Tarrytown, and the Enfield neighborhoods make this a popular place to live for those who work Downtown, like to dine out and be close to amenities, or commute to North or South Austin via Mopac. There are tons of restaurants, parks, outdoor activity areas, and shopping nearby, adding to the appeal of the area. People living here can generally enjoy more green space than those living right Downtown, as well as a slightly lower price point. The median price for a one-bedroom residence in this area is around $1,380. 78746: This zip code moves into what most Austinites refer to as Westlake. Some of the most expensive real estate in the city can be found here, but the apartment selection can be rather sparse. Apartments in the area tend to be luxury-style and are popular amongst those that work in the area or Downtown; mainly catering to single professionals, young couples, or families hoping to take advantage of the fantastic Eanes ISD school district that serves the area. Apartments are often appointed with luxury features and amenities and are usually surrounded by mature trees and ample green space. The median price for a one-bedroom apartment is $1,203 which includes easy access to the area's many restaurants and shopping options as well as a close proximity to Downtown. We noticed some of the most popular zip codes didn’t rank in the top five most expensive, but were pretty high up on the list in terms of price point, so they are worth mentioning. 78705: Sitting just above Downtown in Central Austin, this zip code serves the University of Texas and most of its students, as well as those who work Downtown but don’t necessarily want to live in a high-rise. A one bedroom apartment in this area will set you back around $1,197 on average, which is not too much less than an apartment in Westlake. However, this area offers access to more Downtown amenities and a slightly closer commute. As we mentioned before, this area is really prime for those who work at or attend school at the University of Texas, and many apartments are within walking distance to the school. Residents in this area can enjoy “the drag” and all of the shops and restaurants on it, as well as the many dining options on North Lamar. 78704: While a one bedroom apartment here will run (on average) around $1,135, this is one of the most popular areas for apartment living. Sitting just below the river and Downtown, but above the line that divides South Austin (Highway 290), this area is perfect for those who want to experience the lifestyle of South Austin while still being close to Downtown and having access to all major highways. Not only are there ample shopping and dining options in this area, but there is close access to Barton Springs, the Barton Creek Green Belt, and several nightlife options. The typical renter in this area is a young professional, and apartments are usually set up for social interaction. Some apartments in this area are older which is driving the average price down a bit in our findings, those looking for luxury amenities and upgrades will find themselves paying a few hundred dollars a month more for these bonuses! 78721: The first on our list of cheapest zip codes in Austin is actually an up and coming area, and residential real estate prices in the area are already quite high. Those renting apartments, though, are in luck as the median price for a one-bedroom in the 78721 is still very affordable at $805 a month. Sure, you can still find luxury apartments in this area that will run you upwards of a grand, but there are many 'diamond in the rough' apartments here that are driving the price average down. If you don’t mind searching a bit harder, you can find well-maintained apartments here that are still minutes to Downtown and within biking distance to all of the amenities offered in the 78702. In my humble opinion, this is where you can find some of the best deals in town! 78752: This north central Austin area, which is extremely close to the diverse selection of shops and restaurants on Burnet Road, and close to the growing community of Mueller, is not a bad place to live if you work up north. Home prices in this area are already rising as this neighborhood’s popularity grows. Easy access to Austin’s hip east side makes this place ideal for people who don’t necessarily need to walk to their favorite restaurant but would like a short drive (or even bike ride). It’s also close to Hyde Park, which is a very desirable area full of quirky restaurants and specialty shops. With a median price point of close to $800 a month for a one bedroom, it’s not hard to live an affordable lifestyle here. 78753: Sitting along I-35 and spreading up to Pflugerville, this zip code offers a median price point of around $800 a month. While this area is less walkable than many others, it’s not far from the Burnet area which is a highly desirable place to live. Around Burnet, there are tons of dining options and a really popular vintage clothing and funky antique furniture shopping scene. There is also easy access to the many companies in Round Rock and North Austin, making this a great place to live on a budget if you work in these areas. 78724: The absolute cheapest zip code in Austin, sitting just northeast of Austin's hip East Side, is the 78724, where you’ll find some of the most affordable prices on rental units in the city. With a median price of $675 monthly for a one bedroom, residents don’t have to sacrifice too much for affordable living. Sitting in the area east of 183, south of 290, and west of Toll Road 130, this area offers access to the many employers in Round Rock, and easy access to Cedar Park and North Austin via any of these highways. While this area is less walkable, it’s still a short drive from Austin’s best amenities. One thing we've learned from analyzing this data is that almost any zip code in Austin will offer living options at a more affordable price point if the seeker is willing to go older and/or smaller with their choice of apartment. Sacrificing proximity to Downtown, some luxury amenities, or walkability will obviously provide cheaper options. Another thing to keep in mind is that Downtown prices can be even higher than our recorded numbers because some places charge for a parking spot, valet trash, and other amenities which can raise prices closer to the $2,000 a month mark. No matter your budget - you can find something in Austin that fits your needs!